It's early morning Wednesday and Sisters are packing up and getting ready to head out to various airports after 6:30 AM Mass and Lauds. An intense, grace-filled Assembly is coming to a close but as we head home, whether that be Menlo Park, Langely, Trinidad or Summit, New Jersey we know that we go home united to our Sisters. We don't go home alone! We also go home with official documents recapping the important work that was done at this Assembly. Every sister is amazed at how much we accomplished. 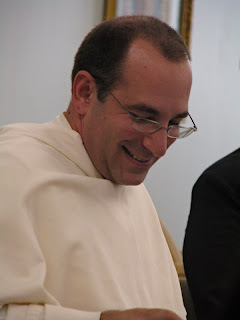 We couldn't have done it without Fr. Dominic Izzo and Sr. Domenica Brennan, a Springfield Dominican sister who gave us canonical counsel throughout. Fr. Dominic's reaction, "Ah, I knew you could do it!" Doesn't he know that without him we'd STILL be discussing the first proposed directory change? Fr. Dominic is as happy as we are with the work of this Assembly. Last night we had an appreciation night. Gifts were given to the Springfield community in gratitude for their incredible sisterly hospitality! We will miss all the lovely sisters here with whom we have interacted and eaten meals with. Sr. Janice and Sr. Mary Samuella will have high places in heaven for their constant, quiet care of us. Often, I would see them in the little kitchenette cleaning up after our break during our discussions. A "schola" sang a song recap the highlights of this week to the tune of, "I've been working on the railroad." It was great! Then the outgoing vice president, Sr. Mary Rose (Farmington) presented the outgoing President and Friar Consultant who also happens to be the ingoing, with gifts of appreciation. Each received a beautiful quilt with themes of their favorite things. Fr. Izzo's was golfing and Sr. Mary John's was, well, believe it or not, motorcycles! In the afternoon Fr. Izzo, with insight and humor recapped the week in a beautiful reflection and then invited us to each give our own thoughts. Everyone expressed the gratitude to be here at this assembly and the beautiful trust and unity that was so evident. 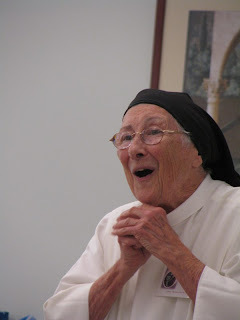 Sr. Marie-Eva (Berthierville) expresses her gratitude. 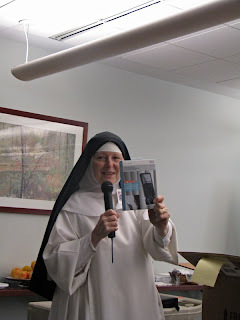 At the end Sr. Mary Christine (Menlo Park) presented to the monasteries with a gift from the Association. At the last assembly the recommendation was made to improve the quality of recordings from each of the monasteries when we have lectures which we share. 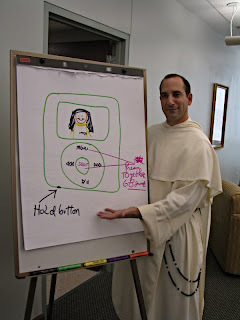 Divine Providence provided, and thanks to the goodness of Apple, the Association was able to present to each member monastery an iPod and recorder! 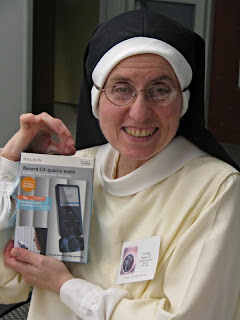 Sr. Maria Christine presents the iPod recorders. It doesn't take much to make a prioress happy! There were detailed instructions on how to use it and as you can see some of our instructions were "high tech"! Fr. Dominic does it again as Consultant!